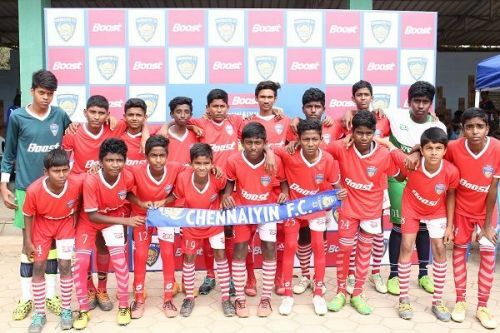 The penultimate day of the BOOST-Chennaiyin FC Football Championship witnessed hard-fought semis in both age-categories at the SDAT Nehru Park Ground in Chetpet. In the U-13 age category, Anjuman Matriculation got the better of Chettinad Vidyashram 3-0 to setup a final showdown against St. Patrick's High School, who beat MCC 2-0 earlier in the day. As for the U-15s, Vidya Mandir edged past MCC 1-0 to secure a spot in the final, where they will face Jeppiaar, who were too good for SBOA, beating them 2-0. The finals in both age-categories will be played on Thursday 21st February 2019 at the SDAT Nehru Park Ground. The U-13 final will take place at 11:15 AM while the U-15 final will kick off at 2:30 PM. The winner of the inaugural BOOST-Chennaiyin FC Football Championship will walk away with the gleaming BOOST-Chennaiyin FC Football Championship trophy, with awards also lined up for the tournament's top scorer (Golden Boot), goalkeeper with most clean sheets (Golden Glove) and the Player of the Tournament (Golden Ball). U-13: 11:15 AM - St. Patrick's High School vs Anjuman Matriculation H.S.S. U-15: 2:30 PM - Vidya Mandir vs Jeppiaar Matriculation H.S.S.